The name Estepona is derived from the Arab name Astabbuna and was undoubtedly a settlement site during Roman times and probably earlier judging by the finds made in the last century but the first written record of a town does not occur until the 10th century. For the next few hundred years the town was fought over until 1457 when it was finally taken and held by the Christians. 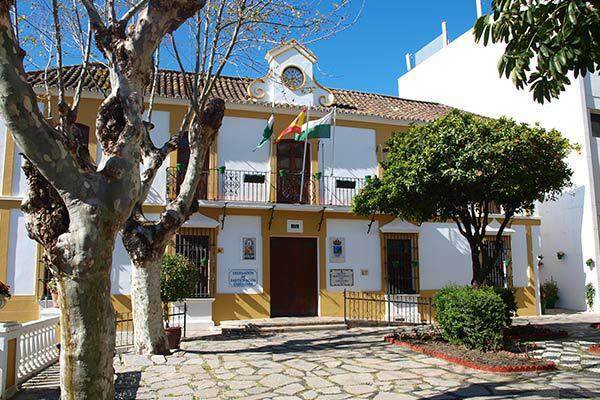 They immediately set about demolishing and burning anything not already destroyed in centuries of siege and fighting and then in 1458 started to build a church and castle around which the modern town of Estepona grew. 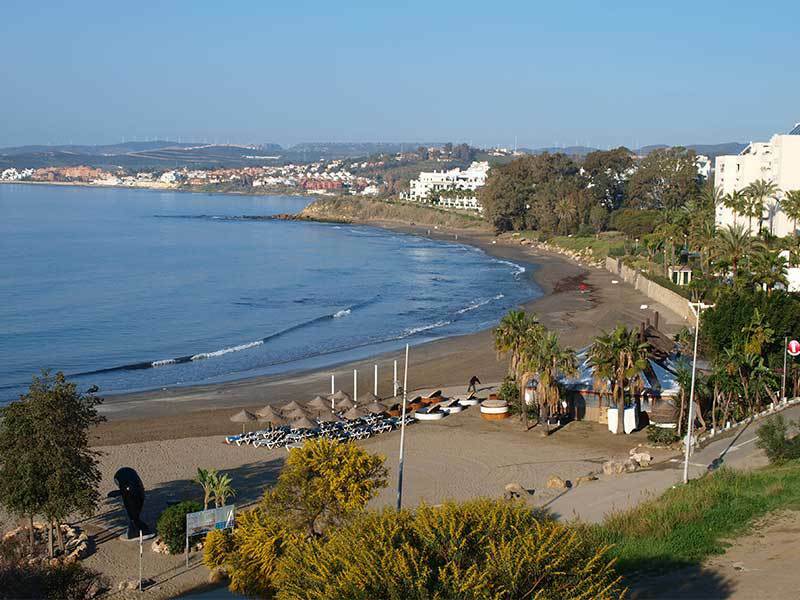 By the 20th century Estepona was a village of about 9,000 farmers and fishermen and 50,000 goats and sows. Today the proportions are reversed with much of the town’s revenue coming from tourism. 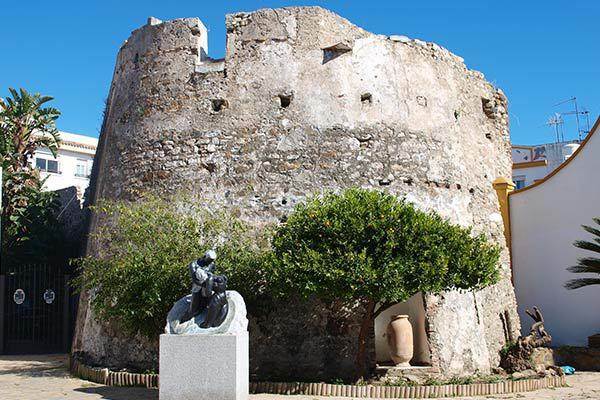 There is very little evidence of the medieval Estepona, merely a part of the castle wall exposed and preserved behind the market. The market itself has suffered from competition from the supermarkets in recent years but still has very good locally grown fresh vegetables and fish caught by local families. The clock tower that dominates this part of town, La Torre del Reloj is all that remains of the church that was completed in 1473. Outside of the town just a little way east of the Carrefour supermarket on the beach side of the road is a Roman water tank and well which, via an aqueduct, supplied water to the fertile valley to the west. The line of the aqueduct now disappears beneath a new development after a few metres. This town is no place for a historian. It is now, unashamedly, a modern town with plenty of shops, restaurants and bars busily burying its past beneath pedestrian precincts, urbanisations and hotels. 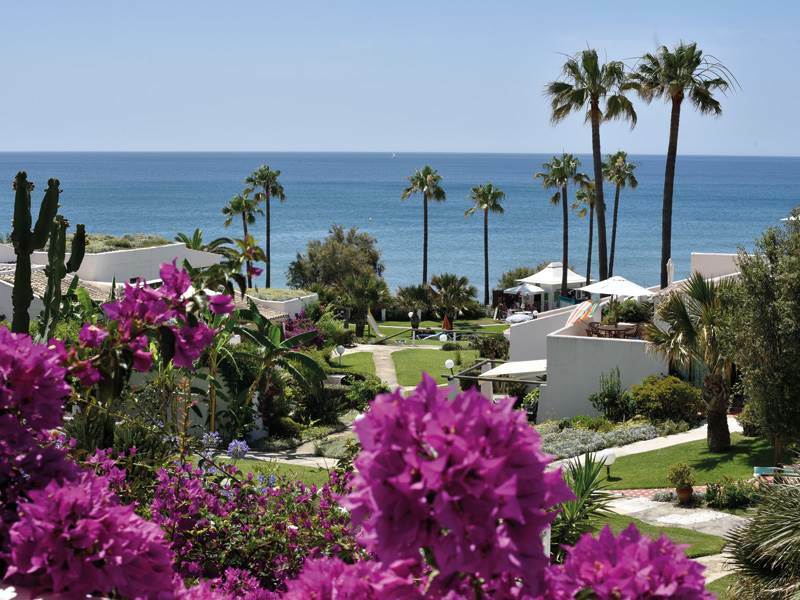 That is not to say that Estepona has nothing to offer the visitor, quite the contrary. 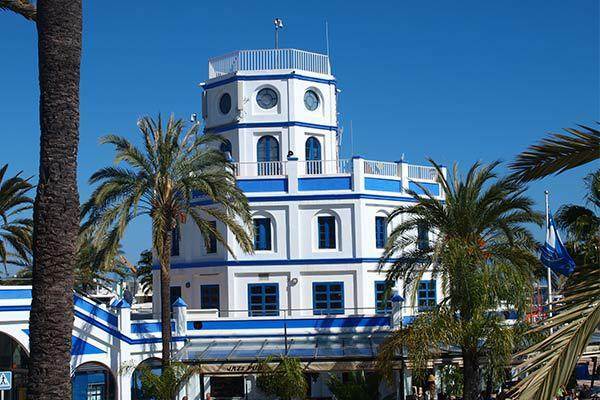 Many visitors stay at the Elba or Estepona Palace Hotels on the western side of the town and port. 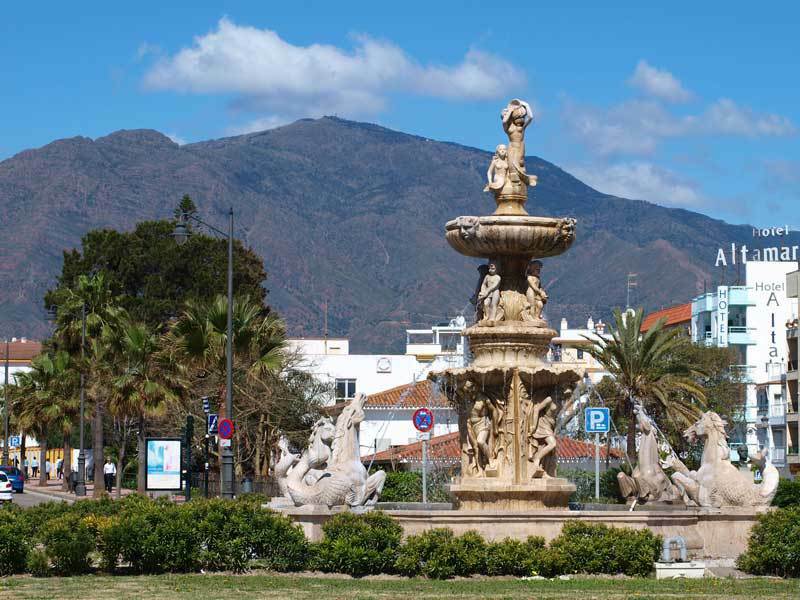 Their first experience of Estepona is often a walk into the town along the shore. They usually find Cristo Beach. This is a horseshoe shaped bay just to the west of the marina entrance, with soft sand, sheltered, shallow water and two chirinquitos open Easter until September. This beach is a firm favourite for families with children. 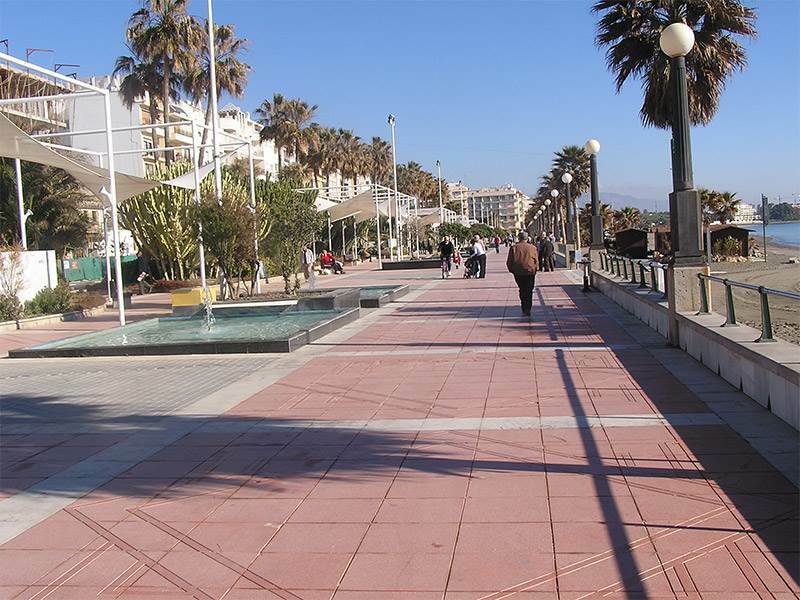 Continuing on the pedestrian visitor will reach Puerto Deportivo de Estepona, Estepona marina. Overlooked by its control tower, the marina offers shelter and moorings to a mix of boats from the local fishing craft to luxury sailing and motor cruisers. 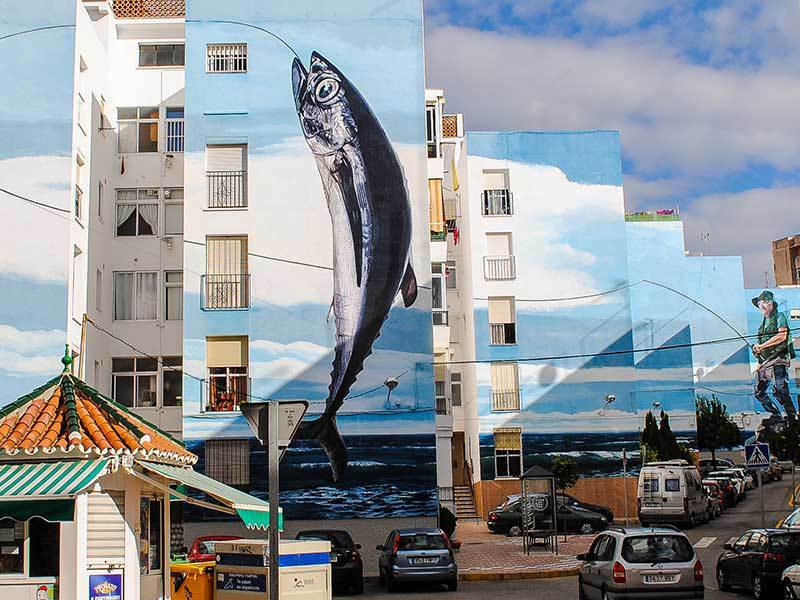 Estepona has a thriving fish market through which much of the catch is processed daily. Some then appears on the local supermarket fish counters and the remainder on the family owned fish stalls in the Municipal Market and in the local fishmongers or pescadero of which there are many in the town. The moorings are surrounded on the land side by restaurants offering food from all nations and bars offering refreshment of a liquid sort, all looking out on the deep blue Mediterranean Sea. On the eastern end of the marina on a promontory, sits the lighthouse. Its light still guides the mariner at night and during spells of bad visibility whilst in its shadow nestle the fisherman’s huts where, each Sunday, an ages long tradition is maintained. Whole families and their many extensions descend for a family reunion and meal. On the menu, fish of course. From the lighthouse the visitor has his first view of the town itself and the promenade or paseo that runs for two kilometres behind the town’s second beach, La Rada. On the rare stormy days the surf thunders in but most days a gentle swell laps the shore. On a summer weekend the entire population of Estepona seems to decamp to this beach. Chirinquitos at regular intervals ensure nobody has to go hungry or thirsty. 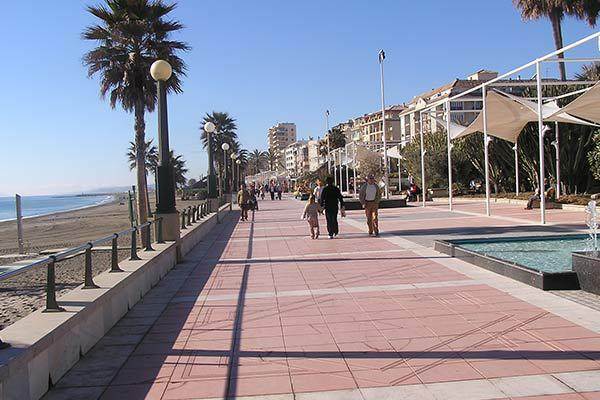 The paseo itself is a thing of beauty, its pink tiled walkway is interspersed with water features and artistically arraigned canvas awnings for shade. Between the footpath and the road is a continuous belt of wide flowerbeds with a variety of planting schemes from cool green shade loving plants to palm trees and plants that thrive in arid climes interspersed with colourful seasonal flowering plants. The town itself is a compact block of a mixture of apartments and traditional single or two story terraced houses. The predominant white of the buildings is enlivened with patches of pastel colours from more adventurous owners. Dominant on a piece of slightly higher ground is the 18th century bell tower of the Iglesia Santa Maria de los Remedios and a distinctive zig zag pattern of blue and white tiles on its steeply sloping hexagonal roof. The town ends abruptly at the foot of a mountain. This is Los Reales, sometimes called the ‘Red Mountain’ because that is how it appears some days when the sun reflects just right of the red igneous peridotite of which it is composed. At 1,454 metres Los Reales is 110 metres higher than the highest mountain in the UK, Ben Nevis. Although the clearly visible summit etched against the blue sky is 9 kilometres from the coast at Estepona, the clear Andalucian air creates the optical illusion that it is but a stone’s throw away. The oldest part of town starts a kilometre from the lighthouse. A pedestrian street, Calle Reale, runs parallel to the paseo, intersected by Calle Terraza. On these two streets and the smaller streets off them are many of the major shops in town. The smaller, often more interesting, family run shops can be found in the narrow, whitewashed streets that lead up to the church and the only remaining part of the Medieval wall. In 2013 and 2014 money was provided to allow the local council to erect and maintain hundreds of hanging and wall baskets throughout the old town. The local householders, many of whom already had colourful displays, joined in the spirit of the time and the result is truly spectacular. In amongst all this floral splendour there are any number of bars ranging from the traditional, dark, bodegas to more modern light and airy ‘gastro bars’. Cafes and restaurants of all sorts can be found in all parts of the town, most with tables and chairs outside summer and winter, to allow customers to watch the world go by. Estepona is still a traditional coastal Spanish town with its roots in agriculture, livestock and fishing. Although it is seeing an increase in foreign tourists it refrains from offering the glitzy night club entertainment that can be had in Puerto Banus or Marbella; the highlight of the week for a visitor at an hotel may be the Friday evening piano recital. For a family holiday, as the Spanish realised many years ago, it is hard to beat. Good food, brilliant beaches, plenty of places to sit and relax and a real ‘Spanish’ feel to the place. Which is also the reason Estepona is becoming more popular with the ex pat population that, in 2014, accounted for 33% of the residents. Well written . 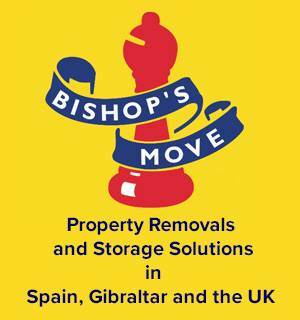 One of the better and more complete profiles of Estepona I've read . Family ( all Canadians ) are converging on Estepona of for the Holidays. I'm forwarding this page .